On Memorial Day, I hear from friends, online and off, about the picnics they are going to, what patriotic looking dish they are making, which pool they are going to. For my family, we don't do anything special. 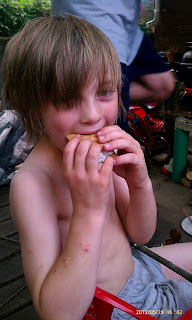 I take the kids and go to a friend's picnic the weekend before Memorial Day, but on the holiday itself, we don't do much more than sleep in and hang out at home. 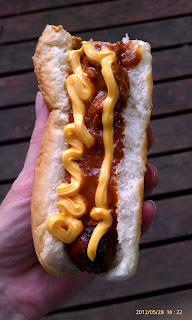 This year, the husband decided he wanted to cook dinner. I obviously did not have a problem with that! He wanted to use our little grill to make dogs and beans. This grill is meant for tailgating, but that has never stopped us from using it at home. 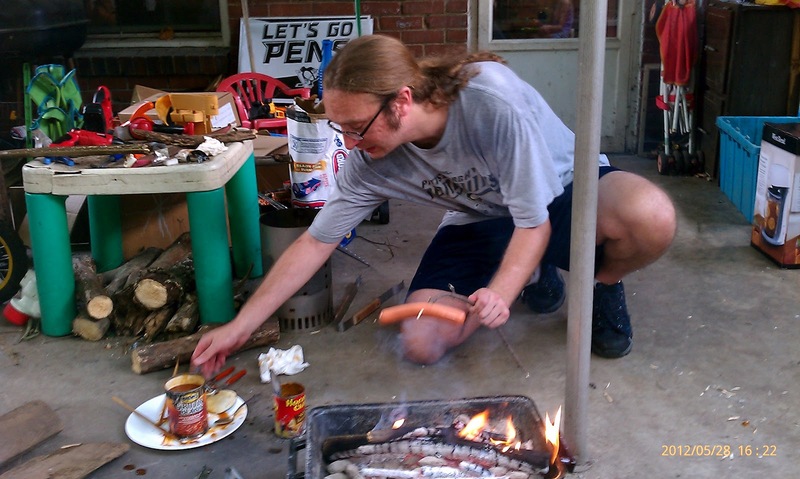 He pulled out the grill and arranged the charcoal. He then asked me where the actual grilling piece was. I had no clue. 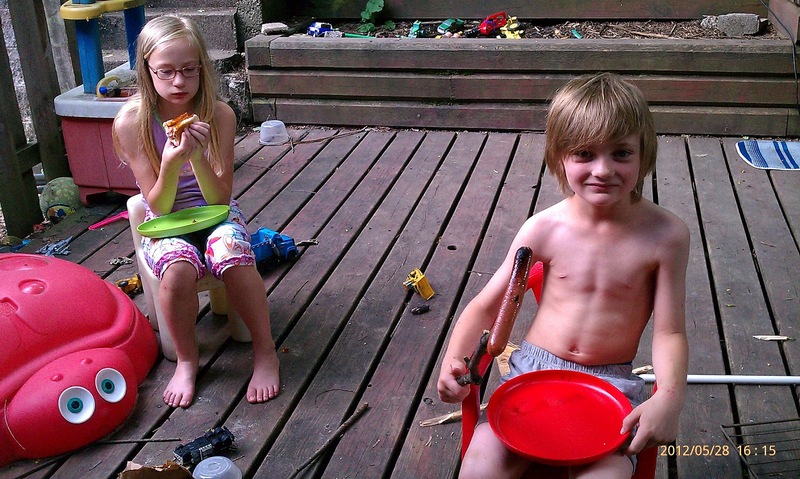 While we looked high and low, he decided it would be fun to cook our dogs using sticks. Of course we found the piece we needed in the drawer under the stove where I keep the cookie sheets, but by this point, Little Dude had heard the stick plan. There was no backing out now! The husband went to work sharpening some sticks while Little Dude arranged chairs around the grill for us to sit on. 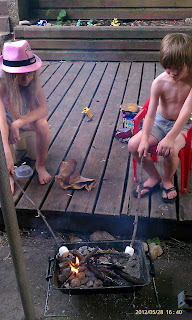 Once the sticks were sharpened and the coals nice and hot, the kids began to cook their own dinner (how awesome for me!). 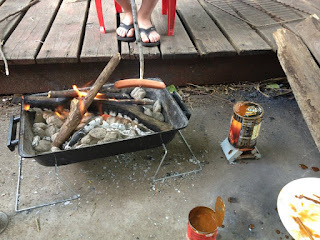 While they were busy roasting their dogs, the husband popped open a can of chili and a can of baked beans. He used a combination of the little grill and a esbit stove to cook his chili in beans. And because no cookout is complete without dessert, we made S'mores! 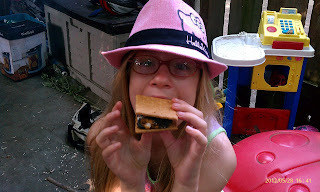 Or one S'more per kid followed by a bunch of roasted marshmallows! After all the marshmallow goo, chili, cheese, and whatever else the kids managed to get stuck to them was cleaned off, the husband and I took the kids out for some more family togetherness. You'll have to stop back tomorrow to find out what that was. How fun!! I bet the kids really enjoyed that. 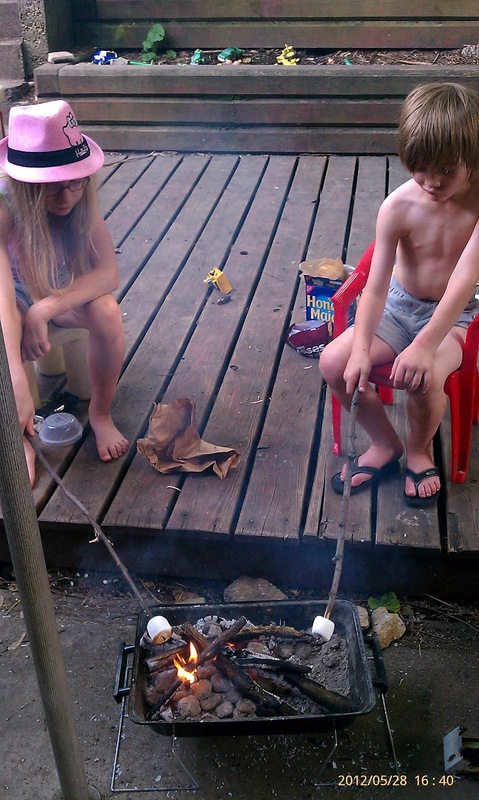 We had some s'mores this weekend too.